Preparation time: 10 minutes. Baking time: 25 minutes. Preheat the oven to 425°F. 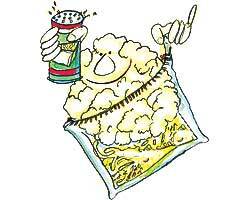 Place garlic, olive oil, and cauliflower in a large zip-top bag; shake to coat cauliflower. Pour into a 9″ x 13″ glass baking dish or large casserole dish coated with cooking spray. Sprinkle evenly with salt and pepper. Bake for 20–25 minutes (or until tender when pierced with a fork); stir halfway through baking. Remove from the oven, sprinkle evenly with Parmesan cheese, and return to the oven for 1–2 minutes, or until cheese melts.